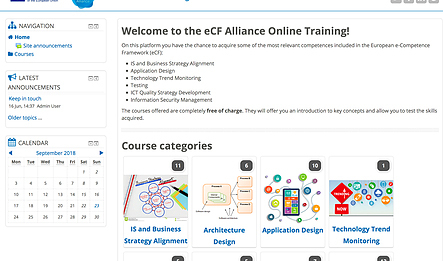 Over the past year the eCF Alliance has been working pilots based on eCF 3.0 in the real world. Real courses, real participants, real feedback. 5 courses were developed, with over 200 students participated (the plan was only 100). Everybody involved learned a lot. Having some feet on the ground and testing the eCF with students of different levels and from different cultures and countries is the best way to see if and how the eCF might become a success. Where all conclusions positive? No, there is still work ahead of us. Has the eCF value for people? Definitely! So what did we do over the past year? WP5 fulfilled 7 activities. Not all pilots were drafted to do all activities with the same depth. They varied due to different levels of participants and different setup of the classes. Which, as such, is a good thing during a pilot. It provides more lessons. This is what it is all about: The certificate! - of six activities and although the approach and settings were different, we also found a number of areas that were difficult for all pilot partners. In Spain and Bulgaria, the pilots were done within a university setting and in Italy and the Netherlands this was done by VETs. Different learning cultures, different levels of participants, different approach in content and format, the variety was the best we could hope for. By having different pilots we learned a lot on how and where eCF content could be applied. Some difficulties also arose during the pilots. Webinars can be produced in different ways (interactive, live, recorded, etc) and on many different levels (record the talks of a teacher, use interactive tooling and content). It is hard to set a standard since budgets will always be limited. During the pilot phase the online course platform with open content also was installed successfully. Candidates can really go there, choose a course and read about the contents, levels etc. Again, the different learning cultures in different European countries provided different content. 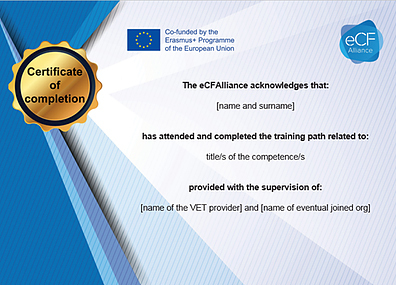 Nevertheless, we worked hard to establish a common approach in terms of connecting to eCF, presenting Learnings Units, describe the course (same length). With a full-fledged solution and many courses available, this can be a good example on how learning can be shaped in the future. This remains an area of development. The eCF can serve as basis for companies for 21st century skills. 64% of participants of the Technology Trend Monitoring (A7) pilot said that the eCF connection is useful (while 36% said it does not really matter). On the question: “how the participants would like to see the assessments and certifications organised?”. We received a mixed set of answers.